Assassin’s Creed fans are no doubt looking forward to the next game in the series, which is slated for release in October this year. And long-time fans of the franchise will welcome the fact that Assassin’s Creed Origins will be bringing several new features and improvements to the table. 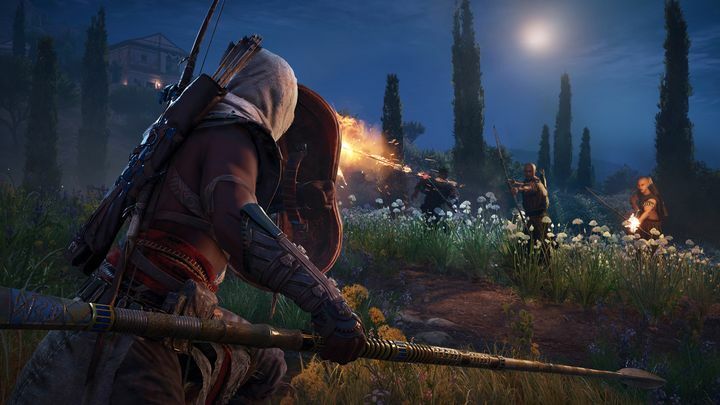 Amongst these is the game’s new combat engine, which will make killing scores of enemies playing as protagonist Bayek an even more satisfying experience in Origins than in the previous Assassin’s Creed games. And as game director Ashraf Ismail explains in the IGN video below, one of the key differences Origins brings to the table combat-wise is the fact that the game won’t be relying on a “paired animation system” this time around. This means that your in-game avatar and enemies will no longer “stick” to each other automatically in combat, meaning that you won’t hit enemies automatically when you swing a weapon, for instance. This means combat will be more strategic this time around, and timing your attacks will be of the essence in order to survive fights in Assassin’s Creed Origins. Also, each weapon will have different ranges and power, letting you approach combat in many ways. Plus, there will be a wide variety of in-game weapons for you to smash your enemies’ heads with including spears, sceptres, exotic swords and also powerful bows which can knock enemies to the ground. Also helping make Origins’ combat more exciting will be the new boss fights, as you will be going toe to toes with special, unique and super-tough enemies at certain points in the game, unlike earlier Assassin’s Creeds which just pitted players against scores of generic enemies. So, it seems the revamped combat in Assassin’s Creed Origins could make playing through the game an even better experience, then. Although it remains to be seen whether Origins’ gameplay really is a cut above its predecessors, something we will find out when Ubisoft’s game ships this fall.